Male Voice-Over Talents – The Voice-Over Guys! Political Commercial Voiceover Demos from MVO: The Voice-Over Guys - Male Voice-Over Talents - The Voice-Over Guys! With political commercial voiceover demos from MVO: The Voice-Over Guys, political campaign managers and political candidates can rest easy. The quality of our political commercial reads can help you be a winner! Whether it be a Republican, Democrat, Independent or Tea Party campaign, MVO: The Voice-Over Guys are great at producing political voice-over for political commercials on radio, TV and web at a local, regional and national level. We understand the importance of political advertising because we’ve been producing political voiceovers for political commercials for a long time. Less thoughtful campaigns may accept any free voice talent for spots provided by a broadcast outlet because the stations just want the media buy. Inexperienced campaign managers or media directors think they’re saving money when really they are costing the campaign the election. 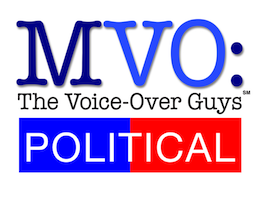 Work with MVO: The Voice-Over Guys to find the voice for your next political campaign commercials.